Among the many discoveries by NASA's Mars Reconnaissance Orbiter since the mission was launched on Aug. 12, 2005, are seasonal flows on some steep slopes, possibly shallow seeps of salty water. This July 21, 2015, image from the orbiter's HiRISE camera shows examples within Mars' Valles Marineris. The sharpest set of eyes peering down at Mars launched toward the Red Planet 10 years ago today. NASA's Mars Reconnaissance Orbiter (MRO) blasted off atop a United Launch Alliance Atlas V rocket on Aug. 12, 2005, from Florida's Cape Canaveral Air Force Station. An Atlas V launch vehicle, 19 stories tall, with a two-ton Mars Reconnaissance Orbiter (MRO) on top, lifts off the pad on Launch Complex 41 at Cape Canaveral Air Force Station in Florida. MRO began its science mission — which was originally pegged for one Martian year, or about two Earth years — in November 2006. Nearly a decade later, the spacecraft is still going strong in Mars orbit, searching for signs of past water activity, scouting out sites for future robotic and human missions and helping relay data from NASA's Opportunity and Curiosity rovers back to Earth. 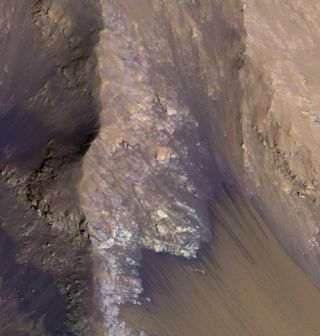 "Mars Reconnaissance Orbiter has found evidence of diverse watery environments on early Mars, some more habitable than others. MRO has discovered that Mars' south polar cap holds enough buried carbon-dioxide ice to double the planet's current atmosphere if it warmed. It’s caught avalanches and dust storms in action," MRO project scientist Rich Zurek, of NASA's Jet Propulsion Laboratory (JPL) in Pasadena, California, said in a statement. "The spacecraft's longevity has made it possible to study seasonal and longer-term changes over four Martian years," Zurek added. "These studies document activity such as moving dunes, freshly excavated impact craters — some of which expose subsurface ice — and mysterious strips that darken and fade with the seasons and are best explained as brine flows." MRO is equipped with six different science instruments, including the HiRISE (High Resolution Imaging Science Experiment) camera, which is capable of revealing features as small as a desk on the Red Planet's surface. The spacecraft returns more data to Earth than the other six active Mars missions — Opportunity, Curiosity, NASA's Mars Odyssey and MAVEN (Mars Atmosphere and Volatile Evolution) orbiters, Europe's Mars Express and India's Mangalyaan probe — combined, NASA officials said. "We've kept our operations efficient. We've been able to bring back an astonishing amount of science data — more than 250 terabits so far," Gilliland added. "Even after more than 40,000 orbits, the mission remains exciting, with new challenges such as taking close-up images of a passing comet last year and supporting next year's InSight landing." That comet was Siding Spring, which buzzed Mars last October, sending material raining into the planet's thin atmosphere. And "InSight" refers to NASA's InSight Mars lander, which will touch down in September 2016 to probe the Red Planet's internal structure. MRO isn't the only NASA Mars explorer to celebrate an anniversary this month. On Aug. 5, Curiosity marked three years on the surface of the Red Planet.